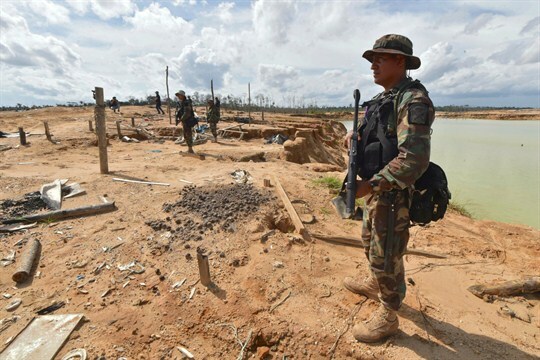 Peruvian police officers stand guard in a recovered area deforested by illegal gold mining in the Madre de Dios province of Peru, Feb. 19, 2019 (pool photo by Cris Bouroncle via AP Images). Peruvian authorities are touting an aggressive new military-led effort aimed at eliminating widespread illegal gold mining activities, which have caused massive deforestation and pollution in the fragile Amazon rainforest. But this kind of militarized environmental management could further complicate an already messy situation in Peru.